It’s been three long years since Natasha Khan — aka Bat For Lashes — released the wildly popular Two Suns (the best album ever to feature a song based on a character from The Karate Kid), so the imminent arrival of her forthcoming The Haunted Man is good news for anyone who loves smart, art-inflected pop music … or just happens to have a strong affinity for Natasha Khan (i.e., a lot of people). It’s hard not to be charmed by her. “Laura” — the first single from the new record — is the kind of tragic and tear-stained piano ballad that seems almost tailor-made for writing alone in your journal by candlelight (in a good way), while the rest of The Haunted Man vacillates between the deeply meditative (the title track) and the kind of hopeful, earthy electro-pop that has become of a trademark of Khan’s work (“Lilies”). Sitting down to chat with her about the making of her new record, I’m struck by how completely unguarded and unassuming she is. At a time when so much of what is ostensibly considered pop music is based on a kind of willful, maniacal artifice, Bat For Lashes is a breath of fresh air. Speaking to Khan about her music and her process, it becomes clear immediately that the music she makes is an honest reflection of herself, which probably explains why it seems to radiate so profoundly with her listeners. Stereogum: In between the last record and this one, did you take a lot of time off? Khan: Yeah. I guess I took three years. I suppose I didn’t take off any time, since I’ve been working since I finished the last one — I’m always in that process of making things — but the difference between this one and the previous one is that I made a decision to stay at home. After the last album I felt pretty drained. Stereogum: You toured that album for a long time. Khan: Yeah, and also it came quite quickly after the first one, so it felt like as soon as the first one was finished, I was almost immediately into making a second one. I had a bit of a breakdown and just really felt like a husk, creatively. I knew that what I needed to do was just stay at home, and maybe go and do some other creative things to nurture myself. So I just started reading a lot, went back to my old university and worked with my old tutor there. I always have sketchbooks and drawings with me, and I really just watched films and relaxed. My sketchbooks were a way to document my thoughts and process. I just went with the themes I was interested in, that started coming up for me, not necessarily in a musical way, but theoretically. My old tutor is a dear friend and she was really good to bounce ideas off of. I worked with some installation ideas and researched self-portraits — things like Frida Kahlo’s paintings — and researched family trees and ancestry. I also started exploring English authors and watching old English films and getting into the Sussex countryside where I was living, and gardening at Virginia Woolf’s sister’s house, which has all this history — just immersing myself in the land and the area. It was quite traumatic though, because nothing was coming to me for a long time and I felt a bit panicked. Khan: I think the more you go through the cycles of creation, the more you realize that it’s the nature of things. You have the harvest and then the ground has to be fallow for a while. But each time you do go through it you feel like it’s the first time you’ve ever experienced it. And that same dread and panic is just as strong. It doesn’t get abated by the fact that you felt it before. 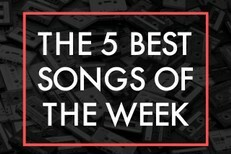 Stereogum: It’s good to remember that. It also feels good to engage the process in some way. For me, as long as I’m reading or doing research or thinking about the work, I don’t get too freaked out about not producing enough words. I feel like I’m feeding the machine in some way. Khan: Yes. I stayed friendly with Thom Yorke after we toured together, and I spoke to him just at the beginning of working on this record. I told him, “I feel like I’m never going to do anything again.” He said that he draws all the time and it helps him. A lot of artists that I speak to, they say you’re still keeping the wheels oiled, though it might not be in your discipline, just by doing something creative. I had to push myself to do it, because I felt so weird. But it did create the foundations of what the album came to be in the end, and I think you’ve got to start somewhere. Stereogum: At what point did it feel like it was starting to happen? Was there a particular song that felt like a turning point? Khan: Yeah, I did some early demos and I took those out to Beck, because we’d worked at the Twilight song together. I think “Oh Yeah” and “Marilyn” were probably the ones that had come from that session. That was a good starting point because we got to play loads of his cool instruments. He’s got all sorts of amazing things to play, and lots of people that came down to play in the studio. Just loads of brainstorming happened, musically, and that gave me some hope. But I think when I first wrote “Lilies” and “The Haunted Man”: Those two songs are pivotal moments. I felt like I defined something through those two songs, and they almost felt like the light and dark aspects of the record. “Lilies” is so pro-life — things blossoming and blooming into life and kind of hopeful, and “The Haunted Man” is very much about the idea of letting things go. So “The Haunted Man” came about and it was like, this was what I needed to cathartically let go of in this record, and “Lilies” was like the blooming in the darkness. Stereogum: Where was the bulk of the album recorded? Khan: A lot of the early stuff and things that stayed in the songs I did on my own — like the basic samples and basic beat ideas — and then I did a lot of the string arrangements and stuff at home. But the bulk of it was recorded with David Kosten and Dan Carey in London in their respective studios. That was sort of interspersed with going out to see Dave Sitek or playing with Rob Ellis in Italy. I kept just kind of going out and doing things and then bringing home the goods and having things to sculpt and place within the context of these songs that I’d laid out. Stereogum: I always think it’s interesting talking to people about the process through which an album reveals itself. You know you have these songs but there’s not always that feeling, at least initially, of how they will make sense together. Khan: I had like 30 or 40 songs at one point, but when I first started, the way I thought the album might be was very different from how it turned out in the end. Certain things helped me, like setting boundaries for things. I had a manifesto about the sound — I wanted it to be more direct, I wanted the vocals to be more upfront. The early demos are very much based on vocals, big bass, and drums, and not much music in between. For a long time there was not much music in between because I was really trying to work on the songwriting, the structure, and the kind of boldness of it. And then what I did in the studio — what I was collecting as I went along — was a lot of little performances and bits of music that kind of filled out the color. So you start drawing the outlines and then you’re filling in the color across the board, and then suddenly this group — this family of songs that seem to belong together — start to step forward. They want to be together, and you try to make it a nice home for them to all coexist. Stereogum: Do you find that you’re a pretty good self-editor? Khan: I do. I think that’s a skill I had to develop, because on the first few albums I was really frightened by changing things and would be stubborn just for the sake of, “This is me and this is what I want to say.” I felt with this one it was a constant process of adding on and stripping away, really only leaving the essence of the best little bits of the things I was experiencing and the people I was hanging out and playing with. I was more precious about what I left in, but it was very much about stripping back and adding until eventually the balance was right. Stereogum: When I was listening to “Laura” the first couple of times, it struck a very primal chord. If that song had existed when I was a teenager it would have been the kind of thing I would have obsessed over, in the same way I obsessed over Kate Bush or early Depeche Mode records. It is the perfect balance of beauty and melodrama. Khan: I had the same thing when I was that age. I fell in love with my first boyfriend, my school sweetheart, and we just listened to Lou Reed’s Street Hassle over and over again. There are a few Carpenters songs and ’70s ballads like Carole King’s “Will You Still Love Me Tomorrow?” … something about “Laura” does remind me of those more subversive, darker ballads. You had that traditional songwriting structure and a pretty melody, but the words sound a bit uneasy. Lou Reed used to do that really well. Stereogum: We were driving back from the country on Sunday listening to the Carpenters. I’d never realized how dark “Goodbye To Love” really is. That song has the most intense lyrics. Stereogum: It’s a beautiful song. Khan: Karen Carpenter is one of my favorites of all time. That’s what I liked so much, that it was in a mainstream pop thing but she had so much other stuff going on. It was so much deeper than that. She’s intense. So beautiful. Stereogum: One of my prized possessions is a Carpenters record I bought in Kansas at a thrift store. I had owned it for years without ever taking the album liner out of the sleeve. When I pulled out the record one day, out came this handwritten note — written on notebook paper, clearly by a young girl — that begins, “How are you? How was your summer? I guess you heard that I tried to kill myself ….” That the letter exists and was never sent is tragic enough, but then it gets tucked inside a Carpenters record? Oh my God. Khan: That’s crazy! So amazing. See, you could write a song about that! Stereogum: Given your background, it must be nice to be able to make music and also be involved in these other media that support what you’re doing creatively. Khan: I feel like music’s a really good thing for me, because I like writing — so lyrically that satisfies me — and I love really detailed production. I got to do the orchestral arrangements [for the new album] and record them at Abbey Road, which was amazing. I love the idea of doing film and music. And I’ve been writing the treatments for all the videos, so film-wise it is very satisfying. I just think for me at the moment, the pop-music arena is somewhere that I can bring in all of those things that I love doing and try to subvert the generic way of doing it. Later I do think I’d like to have a family and maybe do more writing or make more films again. I feel really lucky that I get to do so much stuff. I’m really controlling and I’m allowed to be this demagogue, do all these horrible things and tell everyone what to do. Stereogum: There’s was a lot of hubbub about the album cover when it was revealed. How was the experience of doing the cover shoot with Ryan McGinley? Khan: It was physically challenging, because I had to carry this guy for five or six hours, and I didn’t have any props so that was me actually holding him. I had to kneel down each time I put him down, so by the end of the day I was aching a lot. It wasn’t that hard though. I thought it would be intense — and it was intense being naked with him — but I think that the rawness of it and the naturalness of it felt really liberating. I just got kind of … not necessarily disenchanted, but a bit bored with the way that women present themselves lately. Everything’s very sexualized and lip-glossed and photoshopped, and skin is made to look like leather, everything so unreal. I was looking back at some Patti Smith covers and Robert Mapplethorpe photos and also at PJ Harvey albums and things that when I was a teenage girl I just thought were really cool. I don’t think people have been doing these kinds of visuals so much lately. Also I felt like I’ve generally been so playful — using lots of glitter and makeup and a lot of digital symbolism and iconography and objects and shrine-like stuff — so from the last album I really pushed that to a religious limit. And this time, in line with the music, I just wanted to strip it all back and just be wild and raw. There’s no retouching or photoshopping and I’ve got no makeup on. I think it was liberating. Stereogum: Was it your concept? Khan: Yes, but it is because I saw Ryan’s photos. I’ve been a fan of his work for years, and especially his photos of women and men holding animals around their shoulders, and I was like, “I want to do that but with a man, because symbolically it relates to the album well.” I think it works with the music. Stereogum: Do you look forward to being back on the road? Khan: I feel like I am quite private, so I actually feel much more comfortable being at home and just working, but there’s something about … my confidence is growing lately, so when I went out on tour this year and was actually enjoying it, I was like, “I feel quite good about it.” It’s less taxing. I feel like I’m in a less vulnerable place whereas before I felt very exposed. I’m kind of half-ambitious: I really like the idea of showing my thing and being proud of it. And the other half of it just wants to be at home and make babies and cakes and stuff. If I found the right man, maybe I’d do that. Its kind of an extrovert/introvert complex. I don’t know, I don’t know. I’m torn. Stereogum: The last record, Two Suns, was so beloved by people. It must create a certain amount of pressure. Khan: Yeah, well my self-pressure is the biggest thing. I think the fact that I finished the album is like a milestone in itself because I’m so hard on myself. So to get through to actually finishing a piece of work and putting it out there is my biggest relief. There is pressure, but I believe that if you put something out and you feel in your heart of hearts that it’s the most honest representation of what you’re trying to say and you’ve got integrity … I’ve worked so hard on it for three years, so I really hope people love it. I hope it brings people joy and happiness. If people don’t like it, that kind of is irrelevant. But for the people who do like it, I hope it brings them something special. Because I can’t control how people react to my work, but I always feel responsible for bringing heartfelt joy to people, so I hope that they like it. But what can you do? Bat For Lashes’ The Haunted Man is out 10/23 via Capitol.